Lately James has been astonishing me with some really full sentences; recounting whole pages of books, and telling me about some things that have happened in his day. It’s brilliant and I don’t think I’ll ever tire of his enthusiasm and that excitement in his eye when he tells me these things. For example, his favourite story right now is Goldilocks and The Three Bears (thanks to the fabulous Storytime Magazine!) and he randomly tells me how much he likes picking raspberries, as in the story Goldilocks is collecting blackberries for her mother. 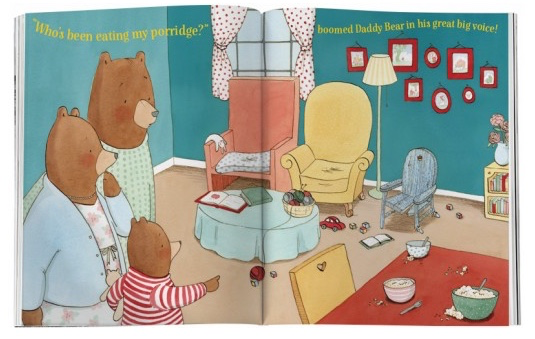 He also occasionally will tell me that the porridge was too hot, or that the baby bear’s bed was “just right”. Anyway, alongside all this brilliant language development I’ve been watching some physical development that’s also quite thrilling. We were in a cafe at the weekend which has fairy lights in the window. They were just out of James’ reach, until he leaned, then moved a cushion and leaned, then knelt on two cushions and leaned, and just stretched that little bit more… Then I stepped in and stopped him because I didn’t want the fairy lights pulled down. I’m so torn! It’s very exciting to see him work these things out, and I feel like he needs to learn, but wow could there be some crazy consequences if I let him do whatever for his ‘development’ all the time. Another very recent development has been the ability to coordinate his hands so that he can pump liquid soap on to one hand. It was really interesting to watch him work out first the pumping action, and then see the soap come out, to working out how to catch it! He spent most of the bath time figuring it out, and the rest using the fruits of his labour on washing his tummy over and over! But again; I don’t actually want him to have this skill, unless he always only does it in the bath! I don’t want liquid soap everywhere!